January 2019 was the warmest month in Australia since records began. January 2019 was the warmest, 2018 was the third warmest and 2017 the fourth. Millions of fish have died. The Bureau of Meteorology will today release its January climate summaries, showing the month was Australia's warmest on record. The mean temperature for January averaged across country exceeded 30 degrees, the first time this has occurred in any month. Australia has increasingly endured hotter summer temperatures. Last year, Sydney sweltered at 47.3C - its hottest day since 1939. "The warming trend which has seen Australian temperatures increase by more than one degree in the last 100 years also contributed to the unusually warm conditions," Dr Watkins said. Officials have confirmed that 2018 and 2017 were Australia's third and fourth hottest years on record respectively. 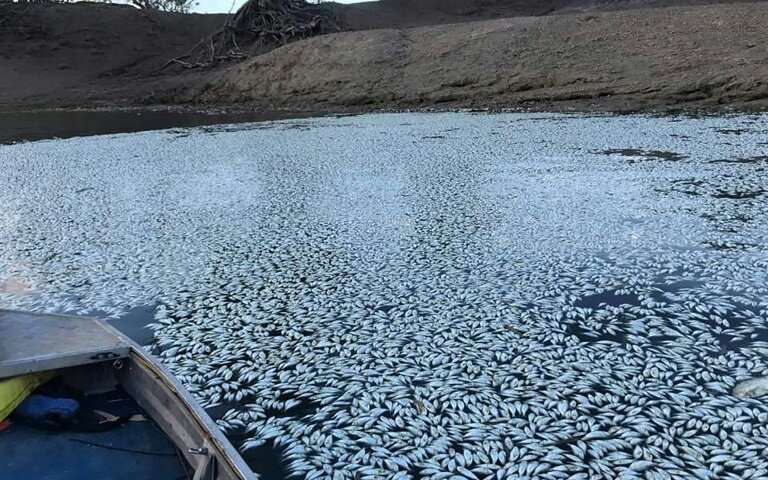 Meanwhile, PhysOrg reports, locals around the Darling River were confronted with a sea of white, as dead fish carpeted the waters near the southeastern Outback town of Menindee. Just weeks after up to a million were killed—with scientists pointing to low water and oxygen levels as well as possibly toxic algae—another mass death occurred in the key agricultural region. Inspectors from the New South Wales Department of Primary Industries have visited the site and said they found that "hundreds of thousands of fish have died". Some 45,000 homes across Sydney's eastern suburbs have been hit by power outages amid a heatwave in the coastal city in southeastern Australia, with media reports of residents being trapped in lifts and one hospital losing electricity. Thousands of native flying foxes have perished due to heat stress in eastern Victoria after Friday's extreme heatwave pushed temperatures into the mid-40s. The Victorian government launched an emergency response over the weekend after dead and injured grey-headed flying fox colonies were found in Bairnsdale and Maffra in eastern Victoria. Staff from the Department of Environment, Land, Water and Planning, Victoria police and local councils, along with wildlife officers and veterinarians, conducted emergency assessments and triage of injured and heat-stressed animals.